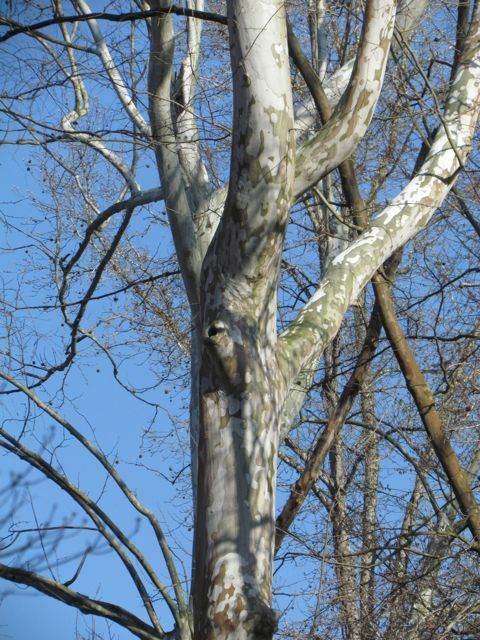 American Sycamore struts its stuff in the winter landscape. 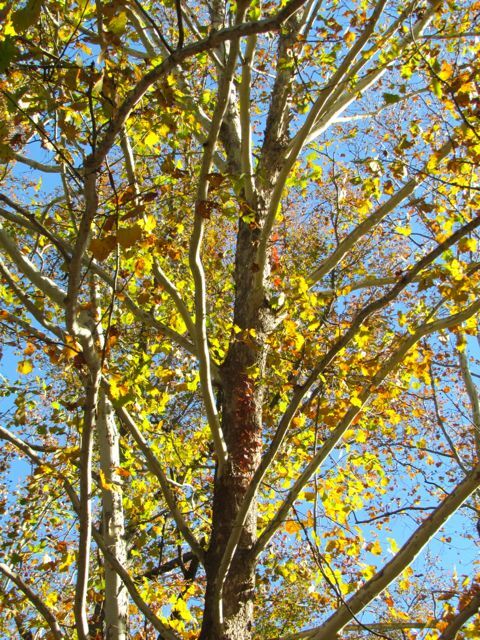 American Sycamore (Platanus occidentalis) is a beautiful tree in any season, but winter is its season to shine in our piedmont landscapes. You’ll find this native giant in moist environments — floodplains and rich bottomlands. But it doesn’t like prolonged wetness, so you won’t see it in swamps. Because it is resistant to pollution, you’ll see it planted along urban and suburban streets, but this is a mistake. More about that a bit later. 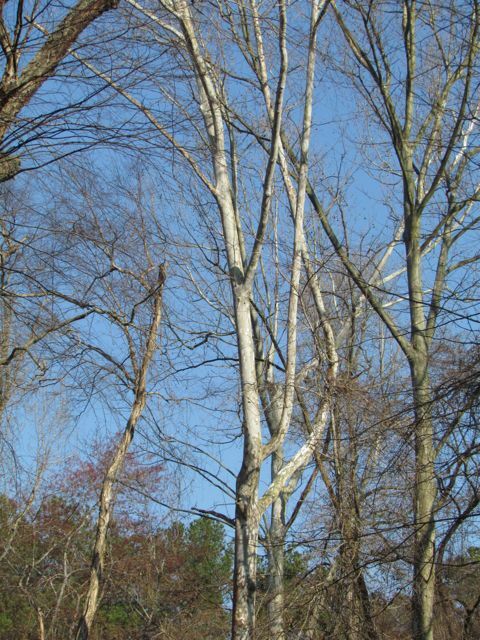 I count myself lucky, because my giant Sycamores grow beside the creek that borders the eastern edge of my property. Every year after the forest casts off its leaves, winter sunrises and sunsets bring out the best in these trees. 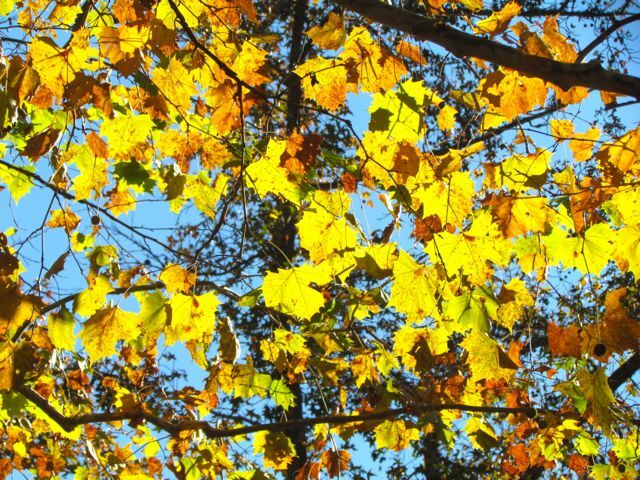 As the sun tops the ridge to my east in the morning, first the white-branched tops of the Sycamores begin to gleam. As the sun climbs higher, its beams move down the white trunks, setting them aglow in the barren winter landscape. As the sun sets each evening, the process reverses. I watch sunbeams work their way up the trunk until only the tree tops are glowing. When a winter sunset turns the clouds red and orange, the Sycamore trunks reflect these colors. This slow-motion painting of the Sycamores is one of my favorite moments in my winter landscape every year. Exfoliating bark on lower trunks. If you’ve read my blog for a while, you know I’m a sucker for trees and shrubs with exfoliating bark. I think it adds a textural element while simultaneously increasing the color complexity of trunks and branches. No native forest giant exfoliates more dramatically than Sycamore. As trunks mature, they slough off chunks of gray-brown bark in large plates to reveal the smooth white inner bark, making older trees readily identifiable in the winter landscape from quite a distance. The irregular branching structure of the canopy is also characteristic of this species. This species is one of our larger native trees, regularly growing to heights of 75-100 feet. In Michael Dirr’s Manual of Woody Landscape Plants, he notes these trees can get as tall as 150 feet. Only Tulip Poplars are routinely taller in our native landscape. Sycamores are also known for their unusually wide trunks that achieve diameters greater than any of our other native trees. 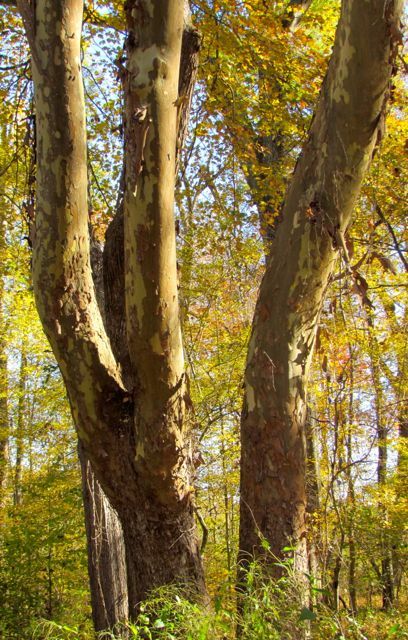 The present-day champion Sycamore is about 11 feet in diameter, but earlier giants were almost 15 feet. These giant older trees are often hollow, and before the landscape became full of the man-made structures they’re named for, Chimney Swifts nested in these massive hollow trees. In my area, there’s a well-known tale about a family of early English colonists who made their home within the shelter of a giant hollow Sycamore until they finished building their log cabin. Sycamore fall leaf color is not dramatic, but I like the mix of warm golds and soft browns. Sycamore leaves are often quite large; their veins are palmately arranged, meaning they resemble the way fingers extend from the palms of our hands. 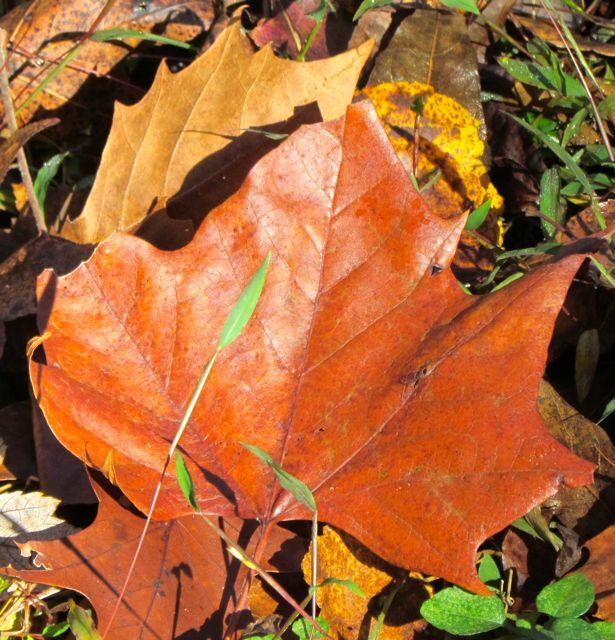 Freshly discarded Sycamore leaves hold their color for about a week before turning darker brown. The numerous fruits look like Sweet Gum balls from a distance, but a closer look reveals they are not spiky, but soft. The seed balls usually hang on the trees until the end of the year. Some time in late winter after a number of rounds of freezing and thawing, a soft wind will tickle the fruits to release their seeds into the air. In my yard, I’ve noticed that all my Sycamores tend to release their seeds simultaneously. I’ll look out at my winter landscape and briefly think it’s snowing while millions of fluffy Sycamore seeds float in clouds through the landscape. The seeds are arranged around a hard small woody center that was used to make buttons by early colonists. One of the other common names for Sycamore is Buttonwood for this reason. A discarded Sycamore leaf. 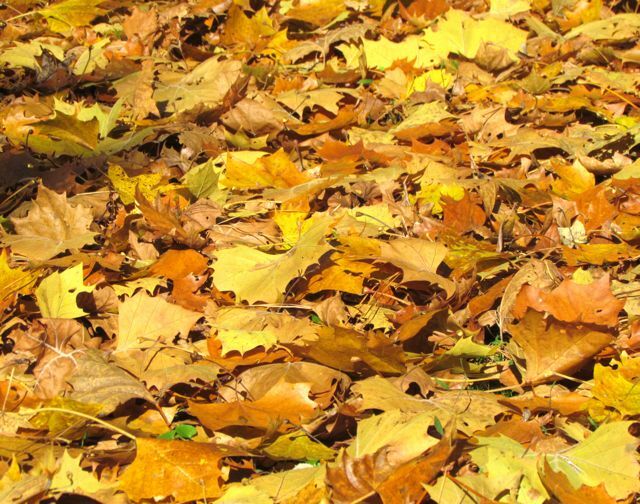 They are thicker than many leaves, usually persisting intact through much of the winter. My research tells me that Sycamore wood’s interlocking fibers make it hard to split, so it was used in earlier times for handles, boxes, and other such items. Now the wood is mostly used for veneer, particle board, and pulp. Michael Dirr advises us to enjoy Sycamores if they occur naturally in our landscape, but not to plant them along urban streets. Stressed trees are prone to fungal diseases, and even healthy trees constantly shed branches (hence the lovely long white trunks) — and those enormous leaves in autumn. Another source tells me that Sycamore sap makes a pleasant drink, and can be boiled down into a syrup. However, the sugar content of Sycamore sap is much lower than it is in, say, a Sugar Maple, so harvesting it for syrup is not practical. On my floodplain, the large Sycamores have many hollow spots where branches have naturally fallen off. I’ve noticed that woodpeckers make frequent uses of these spots for nesting sites. Several such Sycamore hollows have been “remodeled” by Pileated Woodpeckers. Their dark rectangular nesting holes are easy to spot in the white branches of a winter-bare Sycamore. If you’ve got a spot in your landscape for this magnificent native tree, do give it a try. If you’re lucky enough to already have it occurring in your yard, be sure to appreciate its aesthetic qualities this winter. And keep an eye out for wildlife occupants. Humans are not the only animals who appreciate Sycamore’s many attributes. The last autumn leaves were still clinging to my Sycamores only a week ago. This entry was posted on November 19, 2014, 9:47 am and is filed under Favorite Plants, Native Wildlife, piedmont gardening. You can follow any responses to this entry through RSS 2.0. You can skip to the end and leave a response. Pinging is currently not allowed.